Enchant with a masterful, magnetic charisma that will be forever fascinating wearing this dynamic dress by Just Cavalli. 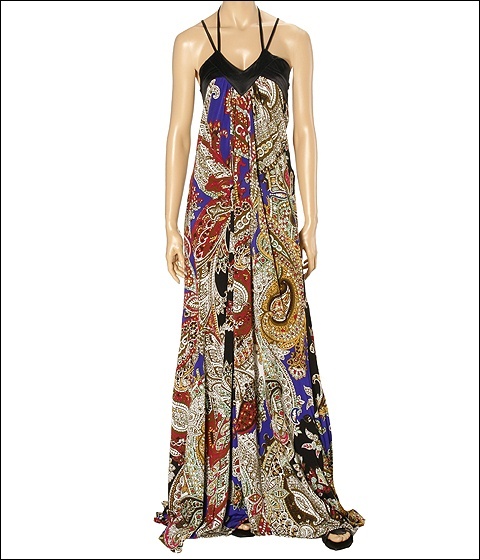 A passionate plethora of multicolored paisleys pattern this precious dress. V-neck. Double spaghetti straps loop through the front and one set of straps ties around the neck. Another set loops through the top back. Top hem is edged in an alternate colored stitched band. Sleeveless. Side zipper closure. 50 length. Outside: 90% rayon and 10% spandex. External fabric: 96% polyester and 4% spandex. Machine wash warm and line dry. Made in Italy.